Great Britain’s defending champions recovered from a crushing semi-final defeat by winning BC1-2 Team bronze in front of another large crowd at the ExCeL. Nigel Murray, Dan Bentley, David Smith and Zoe Robinson lost 18-1 to Thailand on Monday but they bounced back to beat Portugal 7-5, despite needing the judge’s measuring tape on several occasions. They took two points in the second end after two balls were judged to be marginally closer to the jack and built a 5-1 by the half-way mark in similar fashion. 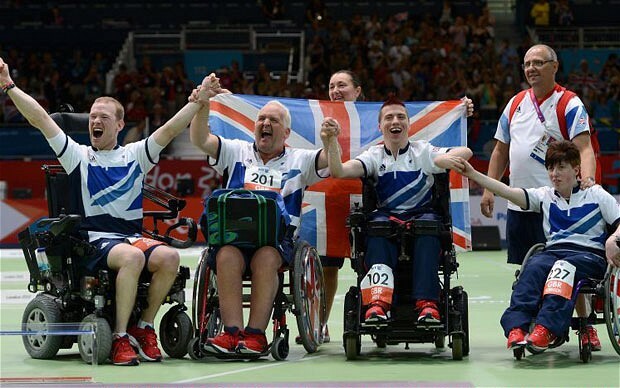 Portugal got four points back in the fifth by throwing the jack to the back of the court and watching GB fail to make the distance but the home quartet held their nerve to complete victory. “It was great to bounce back from a heavy defeat. The Thailand guys took us apart in the semis and even if we were at our best, they would have probably still beaten us,” said Smith, who lives in Swansea. Scotland’s McGuire brothers, Peter and Stephen, missed out on a podium place in the BC4 Pairs after their second loss of the tournament to Canada, this time 8-2. Peter was hospitalised with a chest infection on Sunday evening and was only back in the Paralympic Village for an hour before leaving to take part in Monday’s semi-final defeat to favourites Brazil. All six of the GB players who played in bronze-medal matches return to action on Wednesday when the Individual tournaments get underway.